My good friends and colleagues Richard Tulloch and Ursula Dubosarsky have recently been to New York to see works of theirs performed in theatres on Broadway. In the case of Richard it was his play adaptation of the Dutch children's book, The Book of Everything by Guus Kuijer. (Note: this was Richard's second Broadway production, the first being an adaptation of Eric Carle's works a couple of years ago.) Richard Tulloch is an actor, children's book writer, scriptwriter, travel writer, cyclist and the author of the hugely entertaining Life on the Road blog. Ursula's New York triumph was the adaptation of her children's picture book, The Terrible Plop (No, it's not about what you're thinking.). The play, re-titled simply "Plop!" was adapted and presented by the Windmill Theater of Adelaide, South Australia. But enough of my friends' accomplishments. If there was one place I would have loved to have been this year it wouldn't have been New York City and the Great White Way but Ile-a-la-Crosse, Saskatchewan, Canada. And I'd have been there to see the multi-award-winning, talented kids from the Charlebois Community School of Cumberland House (that's a town) in Northern Saskatchewan in their production of a play of mine called, "Waiting for Joe Doe". How these kids ended up putting on one of my plays is a story in itself. It all started when Lana Patterson, the dedicated Drama Teacher at Charlebois Community School found a copy of the now-long-gone book of my funny plays, Comedies for Kids, and produced one of the plays ("Muck-up at Murder Mansion"---re-naming it "Mystery at Murder Mansion"). She and the cast and crew of Charlebois took it to Northern Drama Festival and won a stack of awards. Later, they did the same with another production of a play also from the same book, "The Perils of Prince Percy of Pomegranate", and again they won lots of plaudits. Cumberland House is a First Nations community and they retitled this play "The Perils of Chief Cimagasiw of Ciciganihk" putting some of it in their first language, Cree. The recent production, "Waiting for Joe Doe", was another comedy play from the same book and, once again, the kids did themselves and their school proud. I'm only sorry that I couldn't have been there to bask in their limelight. And a special oscar to Lana Patterson, drama teacher and dramaturg extrordinaire and to her fellow director Ken Reimer! I only wish I had more plays for guys. At the darkest time of year here in the Southern Hemisphere, what could be better than a public event featuring light? For the fourth year in a row, Sydney has pulled out all the stops to present the Vivid light show festival. This year is the most spectacular one so far. 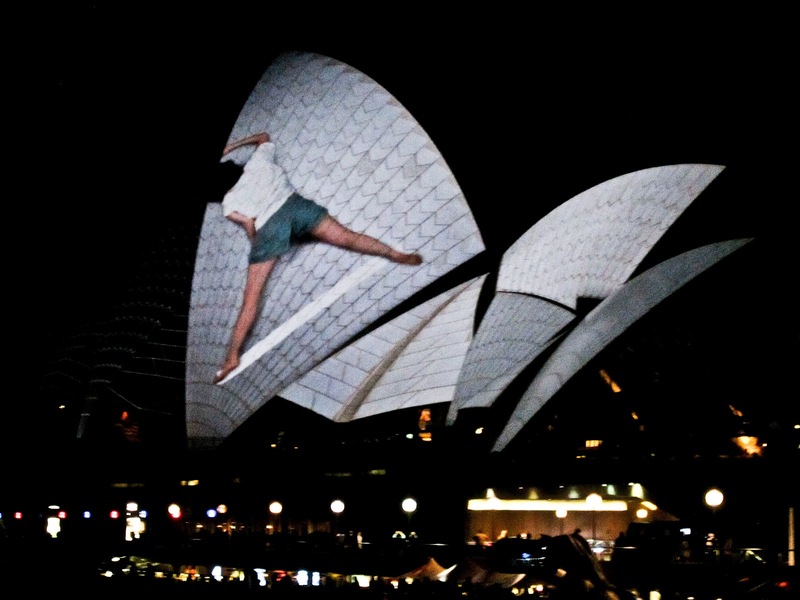 The show has many works of art involving light but the highlights (sorry) are the projections on various buildings including the Customs House (now the City of Sydney library), the Opera House and the Museum of Contemporary Art. Last night there were tens of thousands of people out but, because of the height of the projections, no one blocked our view. The only danger was tripping over tripods because of the phalanxes of serious photographers. The artworks were done by various people including the German light designers Urbanscreen who made the Opera House light projections, the Australian artist Justene Williams' Motion Collaboration # 1 projected on the wall of the Museum of Contemporary Art, and The Electric Canvas whose wonderful cartoon sequence, City Life, is projected onto the Customs House. Judging from the crowds, "Urban Life" is the show-stopper. And, by the way, all these displays have very cleverly designed soundscapes as well. Great stuff. Best in the Southern Hemisphere for sure. As you can see, my own little pocket camera really can't do the artwork justice. Next year I'll take the proper camera and, yes, a tripod. Here's a link to a better video of "Urban Life". Now click on the following link and have a look at Urbanscreen's superior video: "Lighting the Sails". If you can't make it this year---and I realise that for my Northern Hemisphere blog-friends a quick flight to Sydney is probably out of the question---at least have a look at last year's Custom's House light projection. This year's doesn't seem to be on You Tube yet. And, if you've missed it, unlike the transit of Venus---which we saw last week in Sydney---you won't have to wait till 2117 to see the next one.